The Phoenix™ is the most supportive chair of the Seating Matters range clinically designed to help the most complex needs of your patients. The Phoenix chair was named after the symbol of the Royal College of Occupational Therapy and the therapeutic influence is obvious in the design. 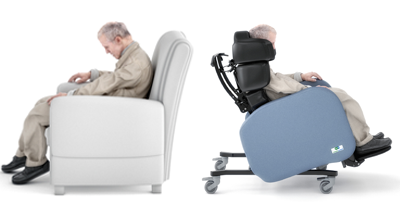 The Phoenix provides maximum support for the upper body with a unique head support for patients with complex postural needs and spinal problems. Designed for posture care, pressure care, early mobilization and safe patient handling the Phoenix is suitable for the most complex level of care. The adjustable shoulder and head supports can perform to the person’s individual posture and position with fast and easy adjustments. With tilt in space and adjustable components, the Phoenix™ will meet a range of individual support needs, sizes and levels of mobility making it ideal for multiple users. Used in rehabilitation settings, it can assist in the development and maintenance of independence or for those with progressive conditions; it can provide additional support as necessary. Ben had kyphosis and a history of pressure injuries and spent 14 hours per day in his chair. He was hoisted for all transfers. Following assessment Ben was sat in a Phoenix chair which greatly improved his postural alignment and prevented further kyphotic deterioration. For more in-depth information on all the PHOENIX™’s features, dimensions and specifications, please feel free to download the operational manual.